Snapchat embraces and champions the ephemeral nature of communication in a landscape that is saturated with it. Snap a pic or a vid, send it to a friend, and moments after being viewed it self-destructs into the ether forevermore. We’re talking about communication that both originates from and elicits an immediate emotional response, as opposed to a long and drawn-out intellectual consideration. For this reason, snapchatting is free of the anxiety surrounding traditional forms of communication. Perhaps this is why the once-spurned app is so popular today. How can employers use this hugely popular social app to educate, motivate, and inspire employees, transforming them into full-fledged brand ambassadors? Could Snapchat be your most powerful tool to drive employee engagement? Only one way to know. Here are five ways you can test it out. Snapchat gives employers an opportunity to learn how to share knowledge in new and exciting ways. Use it to promote and celebrate your company culture from within. Create and share compelling “stories” that capture what life is like at your workplace. Use it to focus staff attention on specific messages and goals. Embrace and encourage the idea of employees creating internal communications that are fun, yet focused on meaningful tasks. Create a Snapchat channel that informs employees of important company news and events, relevant “stories” currently trending, and other hot conversation topics to keep them engaged. Snap and share original content to make company-wide or departmental announcements. Compile and maintain a go-to list of relevant and buzzworthy accounts for employees to follow. Feature an employee, a partner, a department, or a project team on your company Snapchat feed (as either the subject or the creator of snaps or “stories”). Allow employees to nominate features with their own snap submissions. Snap a “story” that explores a day in the life of a particular employee or department. Increase interdepartmental awareness and broaden your employees’ sense of engagement with the bigger brand picture. It is not hard to see how Snapchat could be useful in a project management context — to share status updates and progress reports quickly and efficiently, for example. The creative, urgent, and flash-in-the-pan nature of the app makes it remarkably suited to a fast-paced work environment. Snapchat seems like the perfect tool to keep a team united, energized, and communicating in a creative and fun way around a specific goal. Host a Snapchat contest to rally and socialize staff. 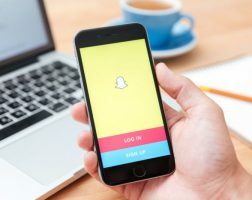 A Snapchat treasure hunt could lead employees on a journey of brand and interdepartmental discovery as they work together in teams to decipher snapped clues. A cropped-image riddle might involve the distribution of an incomplete snap image resulting in employee snaps guessing the complete image. The preferred social media app of tweens, teens, and young adults can now be used as a powerful employer branding tool, offering immediate access to everything from job opportunities, to sneak-peek previews of new products to on-the-fly mini-movies that both entertain and inform. So start snapping. For more on the Brandemix approach to employee engagement, click here.